Our cellphones, tablets and other mobile devices keep us connected and, in many ways, can make life easier. When people are behind the wheels of vehicles, however, mobile devices tend to only distract drivers, pulling their focus off of the task of driving, slowing their response times and ultimately increasing the risk of car accidents. Whether you may think that you have the attention span for texting while driving or you mistakenly assume that this isn’t really a problem in your community, we will highlight some facts about texting while driving in this blog series that can open your eyes. If you end up being involved in a traffic accident caused by a driver who was texting (or any type of driver negligence), it’s time to contact Colorado Springs Car Accident Attorney Kenneth Shakeshaft. He will help you hold the negligent parties accountable while defending your rights to compensation. Texting While Driving: Here Are Some Important Things to Know…. Fact 1: Nearly 1 in every 4 car accidents in the U.S. involves texting while driving. Texting while driving is a serious problem among American drivers, and it causes more than 1.3 million car accidents each year in the U.S. This represents more than 23 percent of all motor vehicle accidents that take place in the U.S. every year. 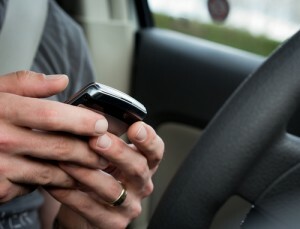 Texting while driving accidents injure more than 330,000 people in the U.S. each year. What this boils down to is that texting while driving is a dangerous practice that clearly leads to accidents but that is also entirely preventable. Fact 2: Texting while driving makes it about 23 times more likely that drivers will be in accidents. Causes drivers to take their eyes off of the roads – When traveling at faster speeds, not looking at the road for a matter of a few to 5 seconds can end up meaning that drivers travel tens to hundreds of feet blindly. Causes drivers to drift outside of their lane of traffic – In fact, one study found that texting while driving causes drivers to be outside of their designated lane of traffic for as much as 10 percent of the driving time. Ultimately, the risk of getting into car accidents when texting while driving is significant enough that drivers should wait until they get to their destination before they pick up their cellphones or other mobile devices. We will resume our discussion of the facts about texting while driving in a few upcoming parts of this blog series – make sure you look for them! Have you or a loved one been hurt in a car accident caused by a driver who was texting? If so, Colorado Springs Car Accident Attorney Kenneth Shakeshaft is ready to help you recover financially and ultimately help you put your life back together.